Immense, projected 3-D images of microscopic paper fibers set the stage for the dance concert "Paper Interiors," in which dancers appear to move within intricate mazes of fibers. The free concert will be performed at 1:30 and 7:30 p.m., March 14 and 15 at ASU's Drama City, at the southeast corner of University Drive and Myrtle Avenue. Audience members will receive 3-D glasses at the door. The concert is a collaborative effort of the Institute for the Studies in the Arts (ISA) and the Dance Department, both in The Katherine K. Herberger College of Fine Arts, and ASU's departments of Biology and English. It is being performed as part of the Southwest Region American College Dance Festival, hosted by ASU this year. 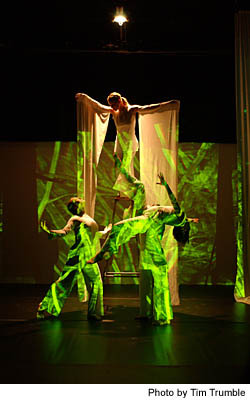 Biologist Charles Kazilek and English Instructor Gene Valentine produced the images that inspired the dance work and provide its backdrop. Valentine created handmade papers of cattails, yucca, agave. silk, wasp nests and other natural fibers. Kazilek photographed them using a scanning-laser confocal microscope in ASU's WM. Keck Bioimaging Lab. He then digitally transformed the photographs into images that could be viewed three-dimensionally using red and blue anaglyph glasses, known more commonly as 3-D glasses. Technologists at the ISA worked with Kazilek to create the system for incorporating the images on a large scale into the dance work. A set of five computers is used to project them on to an ll-by-20-foot screen made of nylon and spandex. The result is a set in which dancers are able to interact with virtual mazes of paper fibers. Innovative costumes add to the multi-dimensional dance experience. Designers Jacqueline Benard and Galina Mihaleva, costume shop coordinators for the Dance Department, used large-format printing technology to transfer paper fiber images directly onto the dancers' nylon and spandex garments, creating striking results when viewed through 3-D glasses. Dance faculty member Jennifer Tsukayama choreographed "Paper Interiors" for Angela Hill, Sophia Martinez-Jensen, Autumn Hor rocks and Emily Finch, all recent graduates of the dance program. "I take the audience into the microscopic world of paper - its interiors - and the audience follows the dancers through their journey into this foreign environment," Tsukayama says. "As they emerge. float and lift their way through their surroundings, the division between human and environment is no longer distinct. Ultimately, the dancers are swallowed into the paper and the two are symbiotic." The Institute for Studies in the Arts is an interdisciplinary research center. The ISA pro vides an environment that supports research and collaboration among artists, scholars and technologists. The goal is to invent and share new forms of art experience and processes for creating and teaching the arts. For information on the ISA, visit http://isa.asu.edu. Tracey Benson, with the Herberger College of Fine Arts, can be reached at (480) 965-7144 or (traceybenson@asu.edu). Insight March 8, 2002. Volume 22. Number 3.